HOLYOKE — Armed with signs and flyers from a statewide advocacy campaign, a small group in a downtown park Saturday spoke out against a proposed surcharge on Massachusetts ratepayers’ utility bills that would finance a new natural gas pipeline. Opponents have dubbed the utility bill surcharge a “pipeline tax” because, while not technically a tax, it would be a mandatory fee applied to the bills of Eversource and National Grid customers. Approved by state regulators last fall, it is currently the subject of a legal challenge before the state’s highest court. The pipeline in question, Access Northeast, would fuel gas-fired power plants in the eastern part of the state. The expansion of an existing Algonquin Gas Transmission line, and the creation of new compressor and storage facilities, is proposed by Spectra Energy Partners, which includes the investment arms of Eversource and National Grid. Around 50 percent of the state’s electricity generation is gas-fired, and energy boosters say pipeline bottlenecks threaten grid reliability and cause high energy costs across New England. However, the protesters — organized locally by Neighbor To Neighbor, an advocacy group with branches in Boston, Lynn, Springfield, Worcester and Holyoke — said the proposed pipeline funding plan would cost Massachusetts ratepayers $3 billion and hurt poor people. The Massachusetts Department of Public Utilities has stated that any plan must show net benefit to the ratepayer. Eversource and National Grid say if their petitions are granted, it would save New England ratepayers around $1 billion during a typically cold winter, with 45 percent of that benefit going to customers in Massachusetts. But opponents on Saturday insisted the proposal would lead to higher utility bills and that corporations cannot be trusted to tell the truth. “It’s another example of how the Baker administration’s policies and priorities are out of sync with what the majority of what Massachusetts voters want and need,” Lisi said. 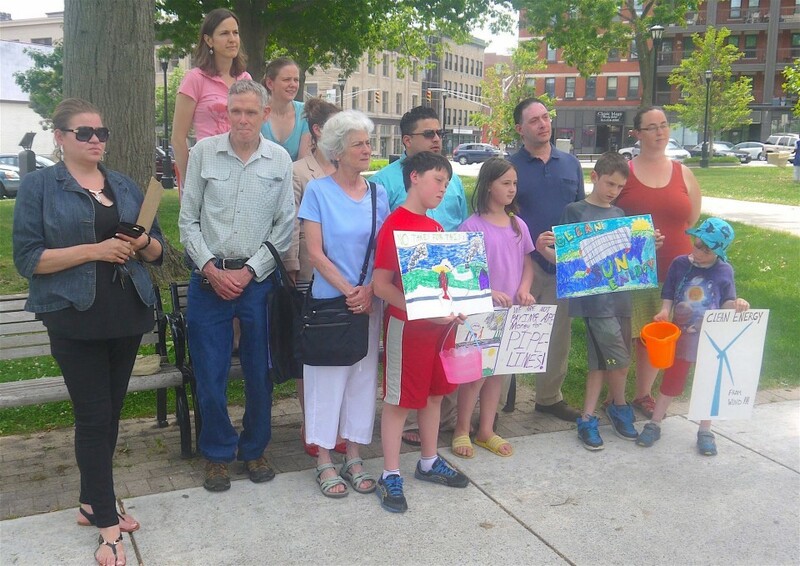 While the protest was held in Holyoke and attended by both Lisi and Ward 2 councilor Nelson Roman, the city’s municipal utility, Holyoke Gas & Electric, has no plans to impose the surcharge on its ratepayers. In October, the Department of Public Utilities issued a novel ruling that said Massachusetts electric distribution companies may contract for natural gas capacity on yet-to-be-built pipelines, and recoup contract costs from consumers. The electric companies would sell the gas on the spot market to power plants, which don’t want to enter into the long-term contracts themselves. The mechanism was proposed by the state’s Department of Energy Resources as a way to provide stable financing for natural gas pipeline companies as they seek approval from federal regulators for new projects in New England, which the Baker administration says are needed. The utility arms of Eversource and National Grid opened dockets with the public utilities department, hoping to secure capacity on two proposed pipelines: Access Northeast and Kinder Morgan’s now-defunct Northeast Energy Direct. In the meantime, the Conservation Law Foundation filed an appeal with the Massachusetts Supreme Judicial Court, arguing that the mechanism violates the state’s 1997 Utility Restructuring Act. The act, designed to create competitive electricity markets, forced electric companies to sell their power generation assets. The court heard oral arguments in May and has yet to issue a decision. The funding idea goes back to 2014, when when the six New England governors met to talk about a regional pipeline tariff. That plan fell apart when former governor Deval Patrick walked away from the table. Now various state utility regulators are looking at individual plans for electricity ratepayers to finance pipelines. The Baker administration said in an emailed statement Friday it continues to support natural gas expansion as part of its overall energy vision. “The administration continues to focus on diversifying the Commonwealth’s energy portfolio and reducing costs for all ratepayers through a balanced approach of renewable energy investments that includes securing additional hydroelectric power, increasing energy efficiency and expanding natural gas capacity along existing routes through continued regional efforts,” said Peter Lorenz, a spokesman for Baker’s Executive Office of Energy and Environmental Affairs. Lisi disagreed with that vision for the future, saying that regardless of whether the surcharge plan would raise or lower bills, the state should not invest in the fossil fuel economy.